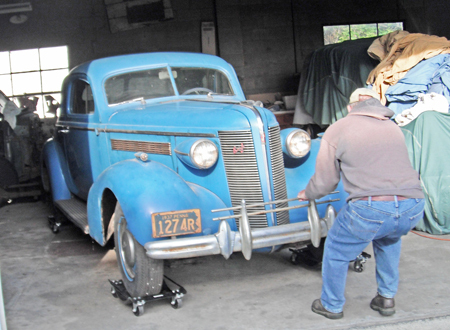 Antique car restoration is not something that happens easily and it sure doesn't happen quickly. During the course of a restoration you will share blood and oil with your machine, plenty of sweat and likely a few swear words here and there. It's a journey that is well worth the trouble. The end product will give you something to brag about, a time machine that will let you experience motoring the way people did in the past, and it will give you a chance to share your victories and defeats with other people who can appreciate what you've done. 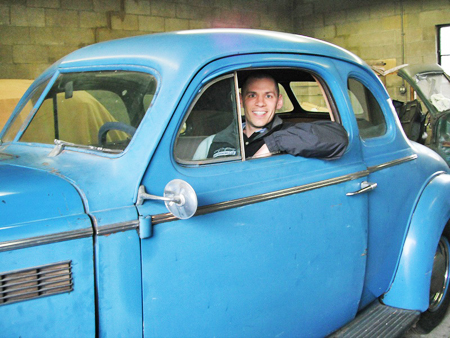 The journey toward that end product is just as rewarding and my car, a 1937 Buick Special Business Coupe, is currently taking that journey. Let me introduce myself. I am Chris Ritter and I live in Bethel, Pennsylvania. I am the Head Librarian at the AACA Library & Research Center in Hershey, PA. I have a very unique and enjoyable job that allows me to be surrounded by old car sales literature, shop manuals, wiring diagrams, paint chips and so much more every day. I started working for AACA in 2008 and after spending a few months with the collection I quickly realized I am in love with cars from the 1930s and anything Art Deco. Post-war cars don't do too much for me, pre-Great Depression cars are cool and respectable but to really get my heart racing I need to see something from around 1934-1939. Big fenders, torpedo headlights, a long engine compartment...you get the idea. I am 34 years old now, but I acquired my car when I was 32. I had a new mortgage, a young wife, and ideas of expanding the family in the near future. While my wife and I agreed that we should have an antique car, we didn't want to settle for something we didn't really love. I could have purchased something from a more recent decade with the money I had available but I decided to wait. Then, something truly amazing happened. A group of eight people from AACA learned that I was hunting for a car and they all generously gave me cash to be put toward the purchase!! In the future I will pay their kindness forward but this is an incredible example of what takes place in the old car hobby. Shocked and humbled that they gave me this opportunity; the hunt was on for the right car. That hunt took place from garages in my home town of Bethel to Gettysburg, PA and all the way out to central Ohio. Fate and luck would step forward again in a chance encounter with a local car guy named Charlie. 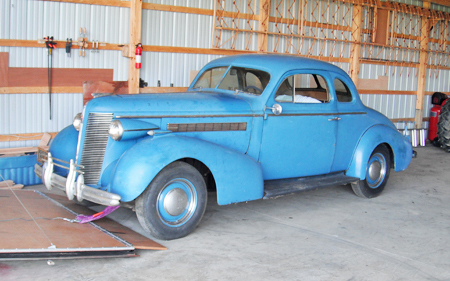 I was on the lookout for a 1936 Dodge when he mentioned his 1937 Buick. Since he lived less than 15 minutes from Hershey, I stopped by after work shortly after our initial chat. It was love at first sight when I got my first glimpse of the Buick tucked into the corner of a garage. Charlie hadn't run it more than three miles since he purchased it 10 years earlier. The owner before Charlie hadn't run it for at least 10 years before that. Looking through a decade of dust, I imagined the finished product and knew this was the car for me. At quick glance I knew the seats needed to be recovered, and the paint was bad (and a non-original color). It had worn out tires and would eventually need everything, but at least it ran when parked — don't they all?! Most fortunate for me was the fact that there was no major rust anywhere on the car. I would encounter a few areas of surface rust under the floor padding later on, but there wouldn't be any need for me to be cutting and patching floor pans, fenders, sills, etc. Behind the wheel for the first time. A deal was made and my boss was generous enough to help me get the Buick home since I didn't have a trailer. It is tough to describe the excitement I felt as we rolled the Buick into the sunlight for the first time, but it was sort of like Christmas, graduation, a birthday and a random party all combined. The transport went smoothly and was less than thirty miles from Charlie's garage to mine. Into direct sunlight for the first time in 10 years. The Buick arrives at her new home. After everyone left and I was alone for the first time with the Buick I just sat in the driver's seat wondering what to do next. There was a little "what have I done" going through my mind but my optimism and excitement quickly came up with the obvious answer: drain and replace the old gas and oil, find a battery and some starting fluid and get this old car started. I got as far as replacing the gas, oil and battery when I hit my first problem. After installing the battery and playing with the lights a bit I smelled and saw smoke from under the dash. I quickly turned everything off and took a look under the dash. What I found was not encouraging—at some point in the past there had been a fire and most of the wiring at the light switch was exposed and brittle. It's only purpose now was for starting more fires. 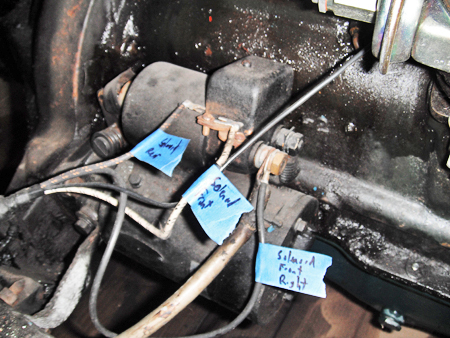 A closer examination of the wiring in the engine compartment revealed wire that was just plain dangerous. 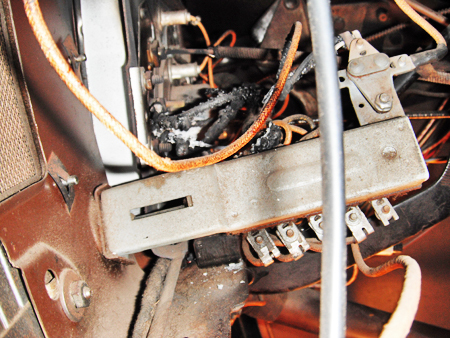 Grabbing a wire and simply bending it a few degrees would crack the insulation exposing bare metal. I knew before I did anything else, my first major project would be replacing the wire harness. Things are a little ugly under the dash. 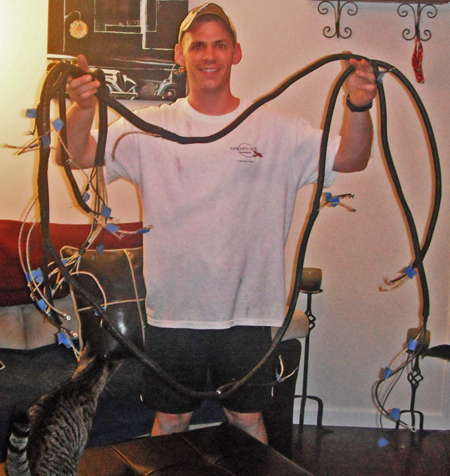 Purchasing a complete pre-made wire harness would cost me close to $1000. That was a huge amount of cash for me. I started flipping through the Buick Service Manual and Owner's Manual when I saw that there was a complete wiring diagram that detailed the wire colors and even the wire gauge for each run! How hard could it be, I wondered, and started looking for vendors that sold the wire I needed. After a recommendation from a friend who restores antique airplanes, I placed an order from The Brillman Company. They had everything from the wire itself to terminals and asphaltic loom originally used on the 1937 Buick. I was able to order everything I needed for less than $200. Also, the fact that Brillman is located in Virginia meant I received my shipment in just a few days. The order from Brillman arrives. While I was lucky to find a lot of detail in the shop manual regarding gauge and color, I had to rely on the old harness to determine length and routing for each wire. That began something similar to an archeological dig. I began by labeling each wire at its connection point. I could have relied on the wire color but I wanted some backup information that would make my assembly job easier. Labeling was easy everywhere except under the dash. There I had to lie on a pillow with the shifter under my arm pit and my feet over the seat. Sure, I could have removed those items but there would be no sport in that! Harness removal was straightforward. I just had to unclip the loom and disconnect each terminal. While the wires were brittle they held up just fine while pulling them out. 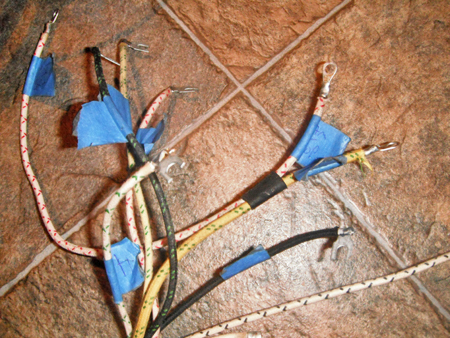 The biggest removal challenges came when pulling the dome light wire and rear half of the harness. On the '37 Buick Business Coupe the wires for the rear lights travel from a connector under the dash, up the driver's windshield pillar, along the roof line and then through the plywood between the trunk and main cabin. The dome light wire connects at the light switch (center of dash), travels to the passenger windshield pillar up to the center of the roof and then on to the dome light switch and the dome light itself. Unfortunately the only way to get at these sets of wire is to remove the headliner. After fully removing the complete wire harness, the creation of the new unit came somewhat easily. I simply had to match new wire to the old, take a measurement and solder on a new fitting. I had the floor space to lay out each wire on the floor but I recently learned of a back-saving alternative which was to have a sheet of plywood on the wall with the exact layout of a car. The new wiring harness is starting to take shape. Holding the new harness with pride. The cat is doing the final inspection to make sure everything is just right. The new wires are labeled to correspond with the originals. The toughest part of the new harness was stuffing the wire through the loom. I taped the loose wire to make it more rigid and in some spots pulled the wires through by taping them to copper welding rods. Installing the complete harness was simple since the removal was fresh in my head. While I was in a wiring mood I replaced the spark plug wires and thought it was time to start the engine. With the help of my father dripping some fuel down the throat of the carburetor the engine caught immediately. It was a beautiful sound and I was incredibly proud that I had crafted my own custom wire harness. My pride was short-lived when I realized that my mechanical fuel pump was not working. I will address that overhaul in my next installment. The new wires are attached to their proper terminals. You can see that there's a lot of cleaning up to do, so we'll leave the labels on, just in case we need to remove the wires later in our restoration. 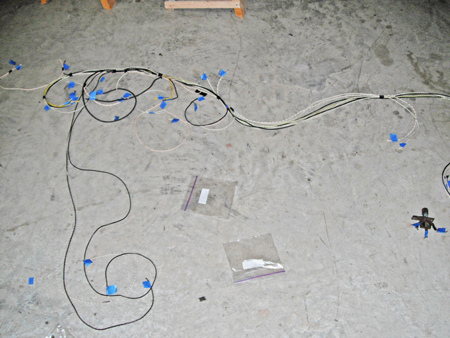 I spread the work of fabricating a new wire harness over two weeks. Looking back I could have done it in a weekend of continuous work. I believe just about anyone could do exactly what I did and save hundreds of dollars in the process. 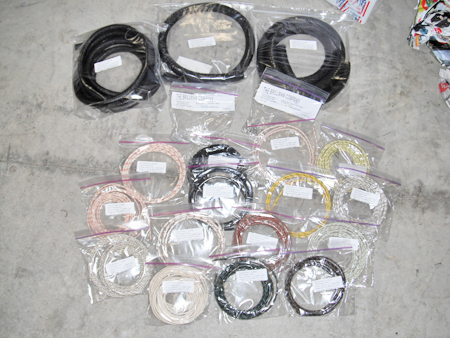 While the money savings, for me, was probably the best reason for tackling the project, another tremendous benefit is the fact that now I have a very intimate understanding of every wire and every connection in my car. If I ever have an electrical issue I should be able to quickly diagnose it and get back on the road.